All the source code in C# required for running the examples below including the simple distribution function can be downloaded at the product page of finaquant® protos. See application examples on the product page. Though most commonly used for financial planning and accounting, allocations and distributions can be needed in any calculation where proportionate (pro-rata) distribution of some amounts is required. 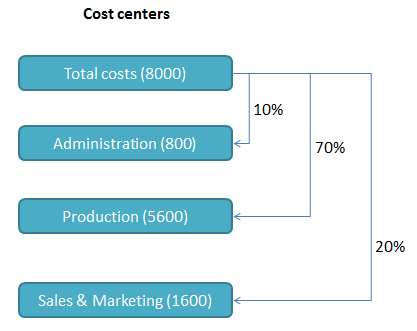 A classical distribution example is distributing costs obtained at company level further to departments and teams in proportion to given key amounts or ratios. 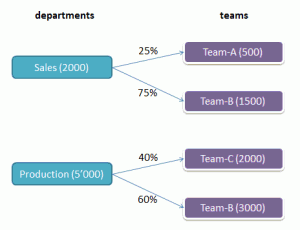 Another example could be distributing bonus amounts calculated at department level further to teams and individuals. Distribution is done from a set of entities to other entities. Let’s take distribution of costs from the entity department to entity team as an example. The initial table costs(department) is transformed into a bigger table costs(department, team) by the distribution with the additional field team. Allocation in turn means distributing some amounts within the same entity group. A typical example is distributing costs from some central cost centers to other decentral cost centers. Note that no additional fields are added into the initial table costs(cost_center) by the allocation; only new field values. Note that an allocation can be formulated as a special case of distribution, as you will see in the following examples. 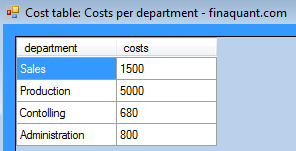 Ensure that we have every attribute and key figure we need to calculate the distributed costs by combining the tables and adding the necessary key figures into the combined table. Calculate the distributed costs by row-by-row processing of combined table. This is a simple and effective strategy which can be used for many other kinds of table calculations. First, make sure that you have all the required parameters as fields of the table, than calculate the desired fields by row-by-row processing of the table. This key figure must be inserted into the table so that it can be calculated by row-by-row processing of table with the formula stated above. 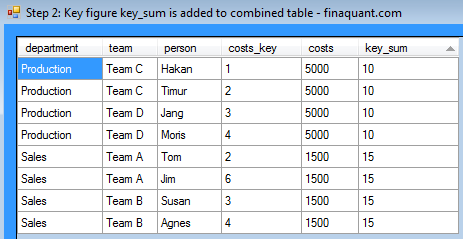 The initial value of the new key figure costs_distributed is zero for all rows of the combined table. The resultant values for this key figure will be calculated with the next and last step. So we obtained the same distribution results. That is, the four distribution steps explained in the previous example are successfully packed into a function with generalized input and output parameters. Now you can execute the distribution function on any pair of input tables (source and key) provided that all the parameter conditions listed above are satisfied. Note that the input tables can have any number of attributes, and they can also have multiple common attributes. In the previous example we had one common attribute: department. In the next example we have multiple common attributes, namely department and country. 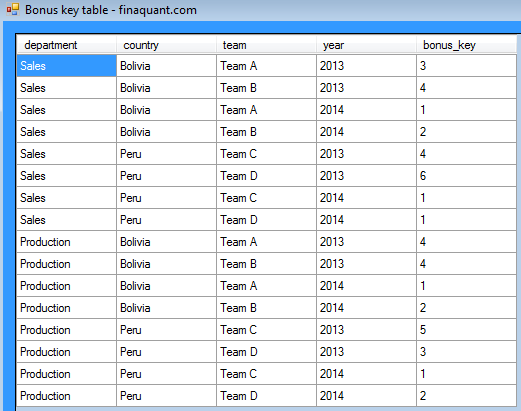 Source and key amounts are specified with this attribute pair. In this example scenario, a company with headquarters in Paraguay has sales and production departments in countries Bolivia and Peru. The bonus amounts as performance incentives for employees are first calculated per department and country. These bonus amounts are then distributed to teams and years. Bonus amounts are distributed also to years, because the bonus payments will be done at the end of 2013 and 2014. 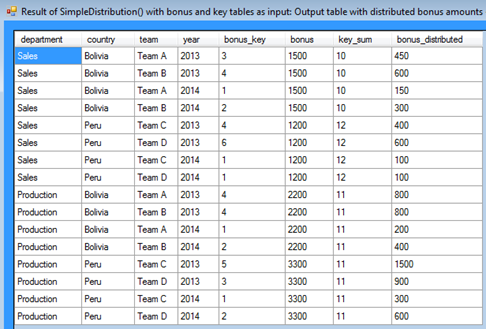 Note that the sum of key amounts (key_sum) are obtained by aggregating bonus_key with respect to the attribute pair department and country that are common attributes of input tables. This example will illustrate that allocations can be formulated as a special case of distribution. In this example scenario, the profits accumulated at a main hub are distributed to other cost centers according to the given distribution keys. Simple proportionate (pro-rata) distribution can be accomplished by simple table functions in four steps. All these steps can be packed into a general distribution function with two input tables representing the source (initial values to be distributed) and key (distribution ratios) amounts. You have a simple proportionate (pro-rata) distribution case. All the parameter conditions for the distribution function are satisfied. There are indeed more complex conditional allocation and distribution cases that cannot be captured by the simple distribution function. Such distribution functions will be offered with the commercial version of finaquant® protos: finaquant® calcs. Nevertheless, if you have sufficient analytical skills, you can calculate almost any kind of distribution with the table functions of finaquant® protos. The key functions will be table combinations, aggregations and transformations (especially row-by-row processing). Allocations can be formulated as a distribution problem, as the last example above illustrates (profit allocation). This entry was posted in Calculation engine and tagged calculation engine, financial planning, table functions, video. Bookmark the permalink.